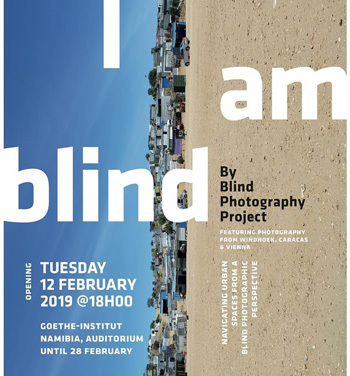 “I am Blind”, will be the first exhibition for 2019 at the Goethe-Institut Namibia, scheduled for 12 February at 18:00, and will be opened to the public until 28 February. The project aims to explore new ways of looking at the city, building bridges between the sighted and visually impaired, challenge common assumptions about the lack of the sense. In the exhibition, the photographic works by the visually impaired, are presented together with the stories of these photographs, but all is written in braille, because the photo without the story is not enough and in the same way, the story without the photo cannot be fully understood. Laschandre Coetzee, Communication and Social Designer said blind people are hidden in our city, sot it is about creating a space and point o interaction which is not usually experienced. “Every set of photographs will be accompanied by text written in braille as a point of having viewers engage with the visually impaired to gain a better understanding of their reality and experiences,” she added. Coetzee said the project collaborated with three visually impaired persons, accompanying them on photographic excursions throughout Windhoek, with all photographs remaining unedited. Leticia Bouwer a participator in the exhibition said, able bodied people do not actually realise what they are capable of and to be honest, neither did she, but she has many visually impaired friends who are crazy about taking photographs and I never understood it. “I have to admit that there is something enjoyable about taking pictures, and even though I can not see them, it is something that I created and can share with others, showing that we are capable of doing something fun and be good at something so far out of league,” she added. The Blind Photography Project was founded in 2015 by Alejandro Loreto in Vienna, Austria, who thereafter applied the same concept in Caracas, Venezuela.